As a medical negligence solicitor, I have investigated numerous claims for compensation involving sepsis, and understand the devastating effect it can have. I recently spoke with Dr Ron Daniels, a Consultant in Critical Care and Anaesthesia, who provided his comments on the condition. Dr Daniels is also the Chief Executive of the UK Sepsis Trust, a fantastic charity that raises awareness of the condition and supports those who have been affected. Sepsis is a common and serious condition which occurs when there is an infection in the body. Whilst it’s often referred to as ‘blood poisoning’, it can affect the entire body. Sepsis can be life-threatening if not treated appropriately. Approximately 37,000 people die every year from sepsis in the UK. In comparison, breast cancer kills fewer than 15,000 people per year. The early signs of sepsis can be quite mild. A patient will often feel generally unwell, and may have a high temperature, cold shivers, a fast heart rate and rapid breathing. In more severe cases, symptoms can include dizziness, confusion and diarrhoea. Sepsis is diagnosed based on a patient’s temperature, heart rate, breathing rate and blood tests in patients suspected to have a new infection. Other tests may also be undertaken, such as a stool sample if you have diarrhoea or a swab of any recent wounds, which is then sent for analysis. The treatment of sepsis depends on how severe it is. “If it’s detected early and has not yet affected vital organs, it may be possible to treat the infection at home with antibiotics. Most people who have sepsis detected at this stage will make a full recovery” says Dr Daniels. However if it’s more severe, you may require admission to hospital. Whilst sepsis is common, it is often the cause of legal claims for compensation. As the initial symptoms can be mild, they are often overlooked and confused with other conditions, such as flu. This can mean that patients are not assessed, and treated, for sepsis when it’s still in the early stages. Any patient with signs and symptoms of infection should have at least a basic physical examination. Another source of negligence can be when sepsis is identified but not treated effectively and quickly. Both a delay in diagnosis and treatment can lead to sepsis worsening and a risk of septic shock, organ failure or death. “As a result of problems with vital organs, people with severe sepsis are likely to be very ill and up to four in every 10 people with the condition will die. Septic shock is even more serious, with an estimated five in every 10 cases proving fatal” says Dr Daniels. If I have been affected by sepsis – who can I talk to? “Although many patients return to a normal life, those who survive sepsis may experience longstanding physical effects, and some suffer from psychological difficulties resulting from their prolonged illness”, says Dr Daniels. 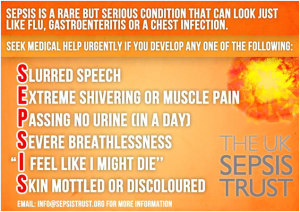 The UK Sepsis Trust offers support to patients and their families affected by the condition. As medical negligence solicitors, we understand that sepsis can be devastating to you and your family. We can provide both legal advice and access to practical support services to help you cope physically and emotionally. It’s important that anyone who wishes to pursue a compensation claim for sepsis instructs a specialist medical negligence solicitor with knowledge of the condition and experience of cases involving it. Ipek is a medical negligence solicitor at Bolt Burdon Kemp with experience of claims involving sepsis. If you or a loved one are concerned about the treatment you have received, contact her free of charge and in confidence on 020 7288 4849 or at ipektugcu@boltburdonkemp.co.uk for specialist legal advice. Alternatively, you can complete this form and one of the solicitors in the Medical Negligence team will contact you. You can find out more about the team here.